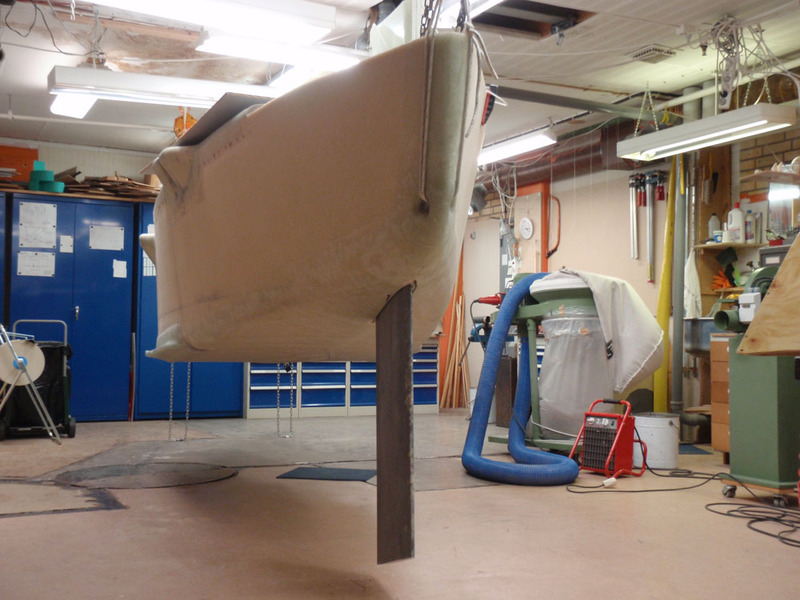 The above and below pictures shows the first steps in installing the bowboard. Matts chinerunners and my big rudder will supply leeway prevention under normal conditions. But as I am trying to do a 50 south to 50 south westward Cape Horn rounding I will surely encounter conditions not always normal. To cope with the expected westerly hurricane force winds I am equipping YRVIND.COM with a big bowboard. 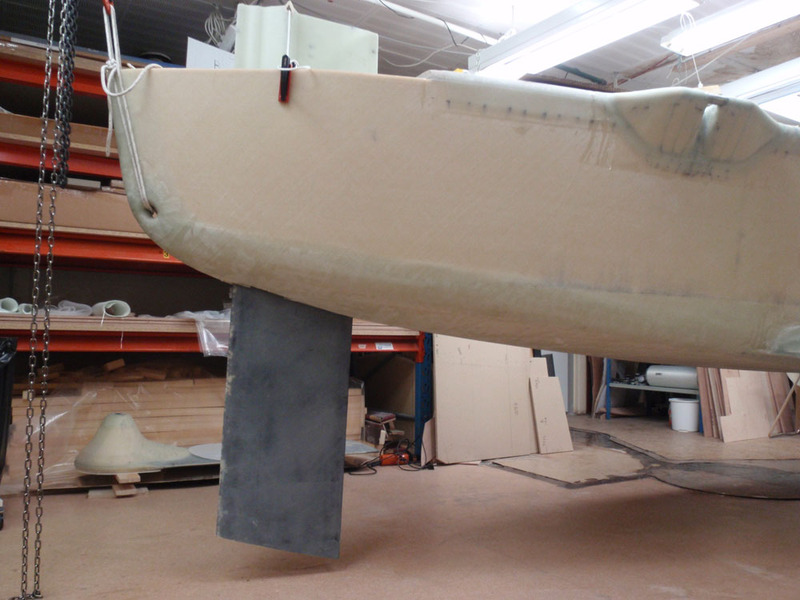 Average keel area to sail area in modern fin keel production boats are 3.5 % with a spread of 0,75 %. Accordingly not many boats have more than 4.25 % keel area compared to their sail area. The area of my bowboard exceeds that many times. With a span of 0.78 meter and a chord of 0.40 meter her area is 0.312 square meter. YRVINDS working sail area is about 3 square meter in a fresh breeze. This gives her bowboard an area of more than 10 % compared to her sail area. That is roughly three times as much as on a production boat, not counting contributions from her lifting body hull, big rudder and chinerunners. 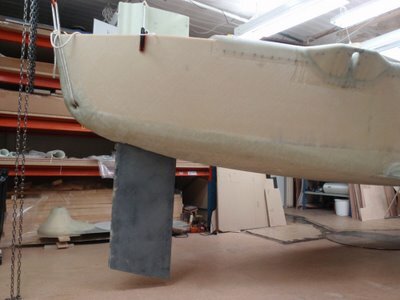 Most likely no other boat has ever had so much lateral area compared to its sail area or wind resistance. The main reason for the bowboard is that it will act as a pivot point in heavy weather. It will let the boat weathercock as it is forward of the sail area and resistance. That is a much better way to avoid being driven back by storms than using see anchors. 1989 sailing from France to Newfoundland in my 15 foot Bris I encountered a series of gales lasting eleven days. When the clouds parted and I could get a few altitudes of the sun with my sextant I found to my joy that I had gained westing. Bris had a bowboard. It was it that weathercocked the boat so that she was not driven back. 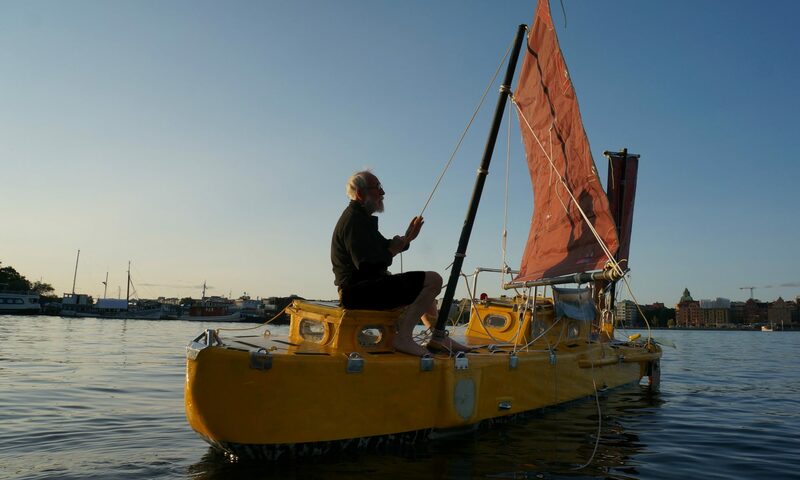 Yrvind have a bigger bowboard and less wind resistance thanks to her lower and narrower hull and her wing mast. With the bowboard down one can lay very close to the wind with a very small sail area. The boat is slowly and compared to other methods comfortable forereaching. Because she is so close to the wind she is taking the waves nearly head on and not much water is coming on her deck. Also unlike with a sea anchor one is able to maneuver, to get out of the way of a ship not under command.